Cirencester Website Design have been building websites since 1997 and have many, many happy clients in Cirencester and the Gloucestershire area. Cirencester Website Design, a trading name of Commatic Ltd and Cirencester Computers Ltd, has a proven record of producing search engine friendly websites that achieve great search engine rankings and help their businesses grab that winning inch. 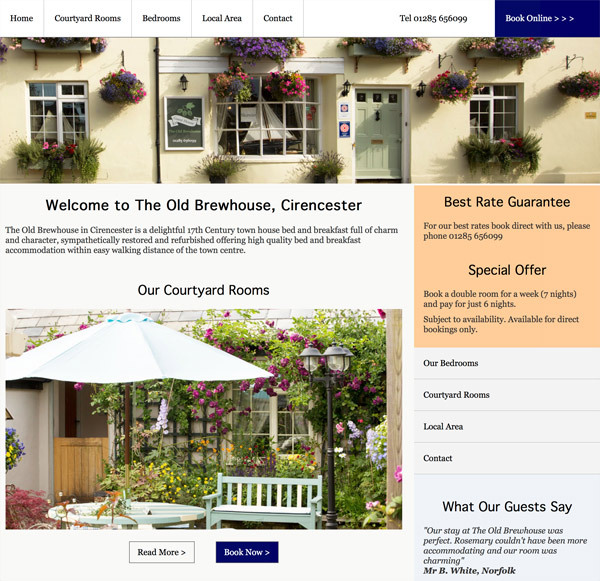 We have built websites for a wide range of businesses including bed and breakfast accommodation in Cirencester, Cirencester accountants, taxi companies, manufacturing firms and even a welding business. We have a loyal client base who are often the source of new work based on recommendations they make to other businesses. While we are an outward looking business with clients all over the UK, we relish working with businesses in Cirencester and the Cotswolds as it means we can form strong, long-lasting links with local businesses and use our local knowledge to maximise the reach of the websites we build. If you are looking for an established Cirencester based website design company who have created websites for lots of Cirencester businesses then please get in touch! There's more to building a website that designing the website itself. Our services also include domain name registration, website hosting, search engine optimisation and internet marketing. Our complete website design service means that we will be with you through the whole lifecycle of your website project, avoiding the need to deal with multiple companies for each part of your internet project. One point of contact for the whole project and ongoing development / maintenance. No call centres, just a real telephone number with a real person on the end of the phone. For over 15 years we have been working with Cirencester companies to make the Internet work for their businesses, making us one of (if not THE) longest running Cirencester website design businesses. Back in the late 1990s, when we started building websites, it was still unusual for a business to have a website and we were one of the first companies offering website design services in Cirencester. We helped many Cirencester companies get one step ahead of their competitors by embracing the Internet and widening the market for their products and services from local customers to national and even international customers. Over the years we have seen many web design companies in Cirencester come and go. Some have lasted a matter of months, others longer. We have been a constant supplier of website design services for well over 15 years and our client base continues to expand, often picking up the pieces left by other website design suppliers who have gone out of business or simply ceased trading. So whether you are looking to get your first website, or you need an old website re-designing, let us tell you how we can help you get a search engine friendly website that looks as good on a laptop screen as it does on a tablet or smartphone. © Copyright Cirencester Website Design 2016 to Present - All Rights Reserved.